The story of Rich Products Corporation begins in 1935, when Robert E. Rich is the owner and operator of Wilber Farms Dairy. While later serving as Michigan's War Food Administrator, Mr. Rich learns about unique research being conducted at the George Washington Carver Institute. Soybeans, it seems, have the potential to be used for innovative new food products. In 1945, while investigating the use of soybeans as a vegetable-based replacement for whipped cream, Mr. Rich invents Rich's® Whip Topping®, the world's first frozen, non-dairy whipped topping. The landmark creation marks the birth of Rich Products Corporation. From the success of its whipped topping, the young company turns its focus toward development of other revolutionary products, including frozen crème puffs, frozen éclairs and the product that will make Rich's a household name, Coffee Rich®. Today, Rich Products Corporation is a global operation, with more than 50 locations spanning six continents. Rich's began reaching outside the United States and Canada in the late 1980s and now produces more than 2,000 products sold in 100 countries around the globe. The company remains one of the largest family-owned, frozen-food manufacturers, with more than $3 billion in annual sales. 0	jplist-folder-All-Posts-42620 jplist-folder-Recipes-42679 jplist-folder-All-Posts-42620 Recipes-Recipes	jplist-topic-Bettercreme jplist-topic-Cookie jplist-topic-Cookie-Dough jplist-topic-Cookie-Sandwich jplist-topic-cookies jplist-topic-Dessert jplist-topic-Rich jplist-topic-Rich-Products jplist-topic-Rich-s jplist-topic-Sandwich jplist-topic-Sweet-Treat	0	08/31/2018 09:15:17	Use our freshly baked cookies and your favorite Bettercreme to make delicious sandwiches. 1	jplist-folder-All-Posts-42620 jplist-folder-Recipes-42679 jplist-folder-All-Posts-42620 Recipes-Recipes	jplist-topic-Breakfast jplist-topic-Cinnamon-Roll jplist-topic-French-Toast jplist-topic-On-Top jplist-topic-whipped-topping	0	08/31/2018 09:15:16	Take breakfast outside the boundaries of everyday with this over-the-top treat. It's a sweet indulgence that's perfect for a sit down breakfast any day of the week. 2	jplist-folder-All-Posts-42620 jplist-folder-Recipes-42679 jplist-folder-All-Posts-42620 Recipes-Recipes	jplist-topic-Bread-Basket jplist-topic-Breadsticks jplist-topic-Flatbread jplist-topic-Focaccia	0	08/31/2018 09:15:16	The first impression is the most important one. Wow your customers from the moment they arrive with an incredible basket of Flatbread Focaccia Breadsticks! 3	jplist-folder-All-Posts-42620 jplist-folder-Recipes-42679 jplist-folder-All-Posts-42620 Recipes-Recipes	jplist-topic-Bar-b-q jplist-topic-Barbecue jplist-topic-Bbq jplist-topic-Dinner jplist-topic-Lunch jplist-topic-Pulled-Pork jplist-topic-Rolls jplist-topic-Sandwich jplist-topic-Sweet-Yeasty	0	08/31/2018 09:15:16	Something Cuban you can actually buy and try! This slider boasts our double rubbed pulled pork, sweet and yeasty roll, smoked ham, cilantro mojo and other delectable ingredients. 4	jplist-folder-All-Posts-42620 jplist-folder-Recipes-42679 jplist-folder-All-Posts-42620 Recipes-Recipes	jplist-topic-Cookie jplist-topic-Cookie-Dough jplist-topic-cookies jplist-topic-Creative jplist-topic-Dessert jplist-topic-Snacks jplist-topic-Sweet-Treat	0	08/31/2018 09:15:16	Break the mold by trying new twists on old favorites - offer a unique cookie that your customers are sure to love. A Pumpkin Pie flavored dessert/snack with Crème Brulee Frozen Custard. 5	jplist-folder-All-Posts-42620 jplist-folder-Recipes-42679 jplist-folder-All-Posts-42620 Recipes-Recipes	jplist-topic-Cookie jplist-topic-Cookie-Dough jplist-topic-Cookie-Sandwich jplist-topic-cookies jplist-topic-Dessert jplist-topic-Ice-Cream jplist-topic-Recipe jplist-topic-Rich jplist-topic-Rich-Products jplist-topic-Rich-s jplist-topic-Seasonal jplist-topic-Sweet-Treat	0	08/31/2018 09:15:16	A Pumpkin Pie flavored dessert/snack with Crème Brulee Frozen Custard. 6	jplist-folder-All-Posts-42620 jplist-folder-Recipes-42679 jplist-folder-All-Posts-42620 Recipes-Recipes	jplist-topic-Appetizer jplist-topic-Dinner jplist-topic-Fresh jplist-topic-Healthy jplist-topic-Lunch jplist-topic-Pizza jplist-topic-Pizza-Crust jplist-topic-Recipe jplist-topic-Vegetable jplist-topic-Veggie	0	08/31/2018 09:15:16	Do as the Romans do, and pile your pizza high with sauteed Portobello mushrooms and tangy fresh goat cheese over a garlic infused crust. Top it all off with fresh basil and oregano and you'll have guests in amorè with your pizza. Why create your standard martini when you can try this? 7	jplist-folder-All-Posts-42620 jplist-folder-Recipes-42679 jplist-folder-All-Posts-42620 Recipes-Recipes	jplist-topic-Alcohol jplist-topic-Bar jplist-topic-Beverage jplist-topic-Dessert jplist-topic-Drink jplist-topic-Martini jplist-topic-Topping jplist-topic-whipped-topping	0	08/31/2018 09:15:16	Why create your standard martini when you can try this? 8	jplist-folder-All-Posts-42620 jplist-folder-Recipes-42679 jplist-folder-All-Posts-42620 Recipes-Recipes	jplist-topic-Couscous jplist-topic-Dinner jplist-topic-Fresh jplist-topic-Healthy jplist-topic-Lunch jplist-topic-Menu jplist-topic-Sandwich jplist-topic-Wrap	0	08/31/2018 09:15:16	In this history-filled country, a crossroads of many civilizations (Roman, Carthaginian, Arab, Turkish and French), Tunisian cuisine has evolved into an art. Our Tunisian wrap is a reflection of the fresh flavors of Tunisia, featuring Virgin olive oil, fresh Roma tomatoes, mint, couscous, and feta and cheddar cheese. Rich’s OnTop® makes it easy to ensure consistent quality, taste and performance for signature desserts, beverages and more! 9	jplist-folder-All-Posts-42620 jplist-folder-POS-Material-42675 jplist-folder-All-Posts-42620 Sell-Sheets-Sell-Sheets	jplist-topic-Aerosol jplist-topic-Aerosol-Replacement jplist-topic-Beverage jplist-topic-Breakfast jplist-topic-Dessert jplist-topic-Non-dairy jplist-topic-On-Top jplist-topic-Ontop jplist-topic-Rich-Products jplist-topic-Rich-s jplist-topic-Richs jplist-topic-Topping jplist-topic-toppings jplist-topic-whipped-topping	0	11/07/2016 14:42:53	Rich’s OnTop® makes it easy to ensure consistent quality, taste and performance for signature desserts, beverages and more! 10	jplist-folder-All-Posts-42620 jplist-folder-POS-Material-42675 jplist-folder-All-Posts-42620 Sell-Sheets-Sell-Sheets	jplist-topic-Celiac jplist-topic-Frozen jplist-topic-Gluten jplist-topic-Gluten-Free jplist-topic-Gluten-free jplist-topic-Par-Baked jplist-topic-Par-Baked jplist-topic-Pizza jplist-topic-Pizza-Crust	0	07/28/2016 16:18:03	Patrons with gluten sensitivity are looking at your menu for GLUTEN-FREE options that taste great. We make it easier than ever to capture your share of this growing market. When it comes to pizza, Rich’s® portfolio of GLUTEN-FREE crusts is the essential foundation of an amazing GLUTEN-FREE pizza menu. 12	jplist-folder-All-Posts-42620 jplist-folder-POS-Material-42675 jplist-folder-All-Posts-42620 Sell-Sheets-Sell-Sheets	jplist-topic-Appetizer jplist-topic-Brownie jplist-topic-Celiac jplist-topic-Chocolate jplist-topic-Cookie jplist-topic-cookies jplist-topic-crust jplist-topic-Dessert jplist-topic-entree jplist-topic-Fudge jplist-topic-Fully-Baked jplist-topic-Gluten jplist-topic-Gluten-Free jplist-topic-Gluten-free jplist-topic-Par-Baked jplist-topic-Pizza jplist-topic-Pizza-Crust jplist-topic-Roll jplist-topic-Rolls jplist-topic-Sandwich jplist-topic-Submarine jplist-topic-Wheat jplist-topic-White	0	07/28/2016 16:11:03	With Rich’s® wide range of GLUTEN-FREE options, your operation can be the GLUTEN-FREE ‘go-to’ for customers with dietary restrictions. From snacks that satisfy, to entrées, appetizers and desserts, we can help you create a safe and deliciously rich experience for your customers – all certified GLUTEN-FREE. 13	jplist-folder-All-Posts-42620 Sell-Sheets-Sell-Sheets	jplist-topic-Artisan-Crust jplist-topic-Artisan-Pizza jplist-topic-Blank-Pizza jplist-topic-Cheese-Pizza jplist-topic-Freezer-to-oven jplist-topic-Frozen-Pizza jplist-topic-Fully-Topped-Pizza jplist-topic-Pepperoni-Pizza jplist-topic-Pizza jplist-topic-Pizza-Blank jplist-topic-Premium jplist-topic-Rich jplist-topic-Rich-Products jplist-topic-Rich-s jplist-topic-Topped-Pizza	0	07/11/2016 10:45:10	New Rich's® Artisan Crust Pizzas feature savory toppings piled onto our new, extraordinary crust that provides a distinctive aged-dough aroma with a bite and flavor inspired by Old World recipes and hometown pizzerias. Rich’s ground-breaking innovation combines exceptional quality with freezer-to-oven preparation and the convenience of a par-baked, making it fast and easy for you to deliver a true on-trend artisan pizza experience for your customers every time. You’ll find it hard to believe they’re not scratch-made! captivate your customers with cookie merchandising! 14	jplist-folder-All-Posts-42620 jplist-folder-All-Posts-42620 Product-Literature-Product-Literature	jplist-topic-Bags jplist-topic-Basket jplist-topic-Bronze jplist-topic-Cling jplist-topic-Cookie jplist-topic-Cookie-Dough jplist-topic-cookies jplist-topic-Dangler jplist-topic-Display jplist-topic-dough jplist-topic-Everyday jplist-topic-Gold jplist-topic-Gourmet jplist-topic-Merchandising jplist-topic-Platinum jplist-topic-POS jplist-topic-Sign jplist-topic-Silver jplist-topic-Stickers jplist-topic-Topper	0	07/11/2016 10:23:15	Did you know?2/3 of cookie sales are made on impulse!Using Rich’s® cookie merchandise support can help you capture the attention of those wandering eyes with clearly marked signage and display cases that highlight the delectable appearance of Rich’s® cookies. 16	jplist-folder-All-Posts-42620 Insights-Insights	jplist-topic-Butter jplist-topic-Clean-Label jplist-topic-Consumer-Trends jplist-topic-Cookie jplist-topic-Cookie-Dough jplist-topic-cookies jplist-topic-Dessert jplist-topic-Everyday jplist-topic-Gourmet jplist-topic-Premium-Ingredients jplist-topic-Sugar jplist-topic-Sweet-Treat jplist-topic-Sweet-Treats jplist-topic-Vanilla	0	07/11/2016 10:15:33	please see the attached. 17	jplist-folder-All-Posts-42620 Sell-Sheets-Sell-Sheets	jplist-topic-Bronze jplist-topic-Chocolate-Chip jplist-topic-Clean-Label jplist-topic-Cookie jplist-topic-Cookie-Dough jplist-topic-cookies jplist-topic-Everyday jplist-topic-Peanut-Butter jplist-topic-Rich-Products jplist-topic-Rich-s jplist-topic-Silver	0	07/11/2016 10:07:07	When it comes to sweet treats, the CLASSICS STILL REIGN SUPREME. Serve our Everyday Cookies and give your customers a taste they'll love at a price you'll love every day of the week!Note: Rich’s® Everyday Cookies replace Rich’s® Bronze and Silver cookie dough that was discontinued on June 30, 2016. 18	jplist-folder-All-Posts-42620 Sell-Sheets-Sell-Sheets	jplist-topic-Chocolate jplist-topic-Chocolate-Chip jplist-topic-Chocolate-Chunk jplist-topic-Chunk jplist-topic-Clean-Label jplist-topic-Cookie jplist-topic-Cookie-Dough jplist-topic-cookies jplist-topic-Dessert jplist-topic-Gold jplist-topic-Gourmet jplist-topic-Platinum jplist-topic-Sugar	0	07/11/2016 10:04:18	If you want to serve cookies that will leave a lasting impression, try our gourmet cookies. Made with WHOLESOME INGREDIENTS you'd find in your our kitchen like natural vanilla and 100% real butter, our Mixing Bowl™ cookies deliver a HOMEMADE APPEARANCE and SUPERIOR TASTE.Note: Rich’s® Mixing Bowl™ Gourmet Cookies replaced Rich's® line of Gold & Platinum cookie dough that was discontinued on June 30th, 2016. 20	jplist-folder-All-Posts-42620 Sell-Sheets-Sell-Sheets	jplist-topic-Cookie jplist-topic-Cookie-Dough jplist-topic-cookies jplist-topic-Filled-Cookies jplist-topic-New	0	07/11/2016 09:57:04	Gourmet FILLED Cookies. Yes, you read that right: FILLED!Consumers are searching for the next up-and-coming item, give them what they are looking for with our NEW Gourmet Filled Cookie Line! Stand out from the rest with these innovative cookies created with only premium ingredients. 25	jplist-folder-All-Posts-42620 Product-Literature-Product-Literature	jplist-topic-flatbreads jplist-topic-Wraps	0	04/09/2015 10:33:05	Flatbreads are the hot trend on menus today. Their versatility and pliability make them a natural for all kinds of creations customers crave, like wraps, Focaccias and pita sandwiches. 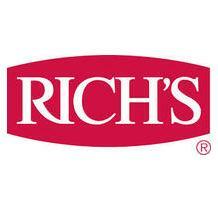 Rich's has just what you need to distinguish your menu with ease and flavor. Our flatbreads are available in plain, herb, Chipotle and white wheat varieties. They come frozen so you can thaw and serve the amount and style you need.